The panic mouse cat toy is sure to get your cat’s predatory instincts going. This toy will cause your cat to lose control, and is a great way to amuse your cat. These fuzzy mice are realistic enough to make your cat love playing with them. The mice come in a pack of twelve, and the only drawback is the small tail which can be swallowed. Da Bird is one of the top cat toys on the list, and it is interactive as well as appealing. The feathers and movement will make your cat pay attention, and give them plenty to do. Better than a cat scratching post, the Chickadee Chirp toy makes noise whenever your cat bats it around. Fair warning though, the toy can be annoying after a while and you may hide it to get a break. These balls are fun for your cat to hit around the room and chase, and they are completely safe for your cat to play with. This is one of the cat toys that requires your pet to do something, and it is a popular choice for pets and owners both. 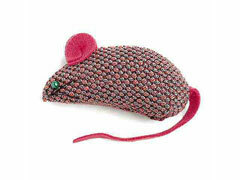 Cat clothes are cute, but the Zanies Realistic Mice toys are fun and will occupy your little angel for hours. One of the top cat toys is the peek a prize toy box. This toy will give your cat mental stimulation as well as physical activity. This interactive cat toy lights up, includes a scratching pad area, and has a track that contains a ball for your cat to chase and hit.